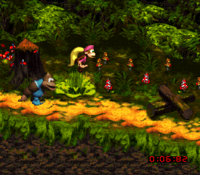 The killer bees are a group of miniature red bees in Donkey Kong Country 3: Dixie Kong's Double Trouble!. They only appear in the stage Riverside Race, where they chase after Dixie and Kiddy Kong until they reach the Level Flag. However, they do not pursue the Kongs while underwater and cannot harm them when invincible. ↑ Donkey Kong Country 3: Dixie Kong's Double Trouble! Nintendo Player's Guide, page 32. This page was last edited on November 24, 2018, at 10:19.